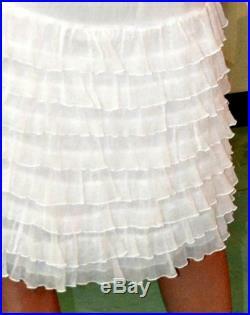 Ivory silk-chiffon ruffle knee length summer skirt , elastic waistband , silk satin lining. All fabrics (top and lining 100% natural silk)size 6, 8 , 10-- usa 36,38,40 -eulength 52 cm, 20 , 5. Could be customized any size , length , your special measurement.